Please read the following disclaimer first, then check what's new at this archive, the last modification having been made on 12 September, 2018 (always check what's new first!! ), or go to the top of the archive. These documents are provided as a service to Canadians and others interested in Canada, who regularly travel the net and who are curious in regards to, "what the fuss is all about." This "collection" is merely here for reference only. If you have a legal question regarding the constitutional validity of a law, or any other legal questions, please consult a lawyer. Every effort has been made to reproduce these documents accurately. However, since these documents were obtained through either OCR (Optical Character Recognition), through the Internet from other sources or otherwise hand-typed, errors of various sorts may occur. Please send e-mail if you find any, thank you. This service is not in any way connected to or funded by the Government of Canada, its agencies, or crown corporations. This is simply a service provided by the author in his spare time as a free reference. Unlike the majority of countries whose basic law derives from one document, Canada's basic law derives not only from a set of documents known as Constitution Acts, but also a set of unwritten laws and conventions. This comprises of all the acts passed since 1867 up to and including 2001. As a result, all constitutional documents during that time period have the force of law. This is analogous to laying a foundation (Constitution Act, 1867) and then building upon it and modifying it as the need arises (the successive Acts and Orders). There are other documents that relate to Canada's development as a country, such as those predating Confederation, which do not hold the force of law, as each act was superseded by the other until the passing and proclamation of the Constitution Act, 1867. Some of these documents include the Charter of Hudson's Bay, the Royal Proclamation, 1763 and the Quebec Act, 1774. Still, section 129 of the Constitution Act, 1867 implies yet more laws prior to this one apply. 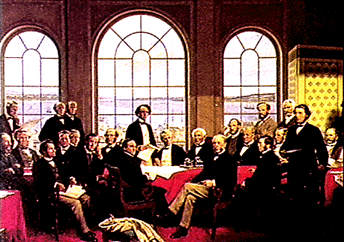 Also, in recent history there have been several proposals (among them the Victoria Charter, the paper A Time for Action, a draft preamble, the Meech Lake Accord and the paper Shaping Canada's Future Together (Charlottetown Accord)) to amend the constitution which either failed to get ratified or were rejected during the original process of drafting the "patriation" formula. Of course, such proposals wouldn't be complete without some committee reports. Amongst those documents cited, there are other important documents worth mentioning also, that have to do in one way or another with the development of Canada's constitution, as well as that of the country. A few of these are the London Resolutions of 1866 and the Quebec Sign Law, Bill 178 of 1988, as well as the Federal law binding Parliament to use a self-imposed constitutional amending formula. Finally, one cannot overlook the great expanse of opinion from many people. Arguments for and against constitutional change are constantly thrown into the public forum, and here a small extract can be found. Still, one can argue that this archive is incomplete, without even regarding documents relating to the evolution of a province, legally, politically and historically. To this end, there is a separate place devoted to that presentation. As you browse through each document, notice how in many of the older enactments the nouns tend to be capitalized: This was a tradition carried from the United Kingdom and was later dropped by Canada. Also note that within these documents, at nearly the top of each of these, you will find a date in parentheses. This is the date when the document was given Royal Assent (i.e., proclaimed into law). N. B. These documents are the English versions. A committee was struck years ago to have them translated into an official French version, but to the best of my knowledge, it handed in its report to Parliament in 1990. Apparently the report was then distributed to the provinces as part of a process to introduce a Parliamentary resolution, but the political climate of the 1990's has halted that process. Interestingly enough, this report's recommended translations has come into question. For more details on this, refer to section 55 of the Constitution Act, 1982. Contributions (particularly for French language versions) to this project are welcome. I have some more plans for this, so stay tuned! Please see the Acknowledgments for a list of contributors who have helped along the way. Any comments are appreciated. You may also see what others have said about this site over the years. The base document of the Canadian Constitution. United Upper Canada (Ontario), Lower Canada (Quebec), Nova Scotia and New Brunswick creating the Dominion of Canada. Created a U.K. style parliament: a House of Commons and a Senate. Section 56 allowed for a Power of Disallowance which gave the Governor General the right to revoke a federal law within two years after it was enacted (In the case of a province, the Lieutenant Governor had one year). Section 57 permitted the Governor General to withhold assent to a bill for a period of two years, after which the legislation would not become law (Again, in the case of a province, the Lieutenant Governor had one year). Section 90 applied sections 53-57 to the provinces. Section 91 provided for federal powers, while section 92 laid out the powers for the provinces. Section 93 guaranteed denominational education, as well as education in general to be the jurisdiction of the provinces. Neither a domestic amending formula nor a 'bill of rights' included. Schedule 6 was inserted by the Constitution Act, 1982 to give the provinces juridiction over the environment. A British Law empowering the Queen to accept all lands belonging to the Hudson's Bay Company and the North-Western Territory (as it was then called) become, at a later date and at the United Kingdom's discretion, part of the Dominion of Canada. Allowed the government of Canada to create a temporary government for Rupert's Land when it was admitted into the union. Created the Province of Manitoba and established its government. The actual Royal Order declaring that Rupert's Land become a part of Canada, effective July 15, 1870. Contained resolutions of the House of Commons and the Senate of Canada petitioning for the admission of the territories into the Dominion of Canada, plus several memoranda. Contains a deed of surrender, detailing districts, trading posts and acreages. Set conditions that the Canadian government was to allow Hudson's Bay Company to trade without hinderance, and to pay them compensation, plus allow the Company the right to claim blocks of land of specific sizes for their own use under certain conditions and in certain areas. Relieved Hudson's Bay Company of any unsettled Indian Claims, effectively making it the responsiblity of the Canadian Government. Admitted British Columbia as a Province into the Dominion of Canada. Gave Parliament the power to create new provinces out of the Northwest Territories (then recently acquired from the Hudson's Bay Company and the Queen). Admitted Prince Edward Island as a Province into the Dominion of Canada. Amended by the Constitution Amendment Proclamation, 1993 (Prince Edward Island). Clarified the power of the Canadian Parliament to legislate over, "privileges, immunities, and powers of," its members. Admitted all remaining territories of British North America surrounding Canada (except Newfoundland) into Canada. Allowed parliamentary representation for citizens residing in the Territories. Extended the boundaries of Ontario. A general law repealing certain 'spent' (obsolete) laws, including 10 'spent' sections in the Constitution Act, 1867. A technical act which confirmed the validity of another law regarding the Deputy Speaker of the Senate. Created the Yukon Territory, separate from the, "North­west Territories"
Provided for its government and court system. Created the province of Alberta. This law created the administration and the government and designated Edmonton as its capitol. Allowed the province to abolish the jurisdiction of the Supreme Court of the North-west Territories so it could create its own superior court later. Created a system of subsidies to be provided by the federal government to the province. Specified that all remaining assets and liabilities of the North-west Territories be divided equally with Saskatchewan. Created the province of Saskatchewan. This law is exactly the same as the Alberta Act, except where it pertains to Saskatchewan. Amended the federal-provincial transfer payment schedule. Readjusted the number of seats in the Senate from 72 to 96. A general bill that repealed a number of Acts, including the British North America Act, 1916. A collection of Agreements made with the provinces of British Columbia, Alberta, Saskatchewan and Manitoba which transfered all rights and interests of certain natural resources. Removed legislative authority of Parliament in the United Kingdom over the Dominions (Canada, Australia, New Zealand, South Africa, and Newfoundland), with the following exception: As the Canadian delegation had been unable to settle on an amending formula, the existing scheme (i.e. a simple British law, subject to amendment by the U.K.) was retained. Gave the Federal Government under Parliament the power to legislate laws repealing unemployment insurance. Delayed the decennial re-adjustment of the seats in the House of Commons until World War II was over. Changed section 51 of the Constitution Act, 1867, to bring the number of members in the House of Commons to 255. Defines the role of the Governor General in relation to the monarchy and government. Specifies method of succession to the office in case of death or incapacity. Defines other powers to be exercised by the Governor General. Admitted the last British North American colony to the Dominion of Canada, making it the tenth province. Gave religious entities special power over education, according to Term 17, which was the subject of a referendum in 1995. Gave the Parliament of Canada limited powers to amend the Constitution of Canada. A very broad Act which repealed many laws enacted by the Parliaments of England, Great Britain, and the United Kingdom, some dating from before 1800. In Canada's case, section 118 of the Constitution Act, 1867, was repealed. Gave the Federal government the power to enact laws regarding old age pensions, such as, e.g. Canada Pension Plan. Changed section 51 of the Constitution Act, 1867, to bring the number of members in the House of Commons to 263. Changed the length of term of office for superior court judges (including those of the Supreme Court) to 75 years of age instead of for-life. Gave Parliament the power to legislate laws regarding old age pensions. Changed the length of term of office for Senators to 75 years of age instead of for-life. Changed the rules for calculating the number of MPs to sit in the next Parliament. Gave the Yukon and Northwest Territories representation in the House of Commons. Increased the number of Senators from 110 to 112. Gave the Yukon and Northwest Territories representation in the Senate with one member each. From that time on, the United Kingdom Parliament relinquishes the power to affect any Canadian laws, including the Constitution. Part of an act which 'patriated' Canada's constitution, due to Pierre E. Trudeau. Included a domestic amending formula (7 provinces / 50% of population, sections 38-49 - as proposed by the Government of Alberta) plus a clause which compels the Prime Minister to call a First Minister's Conference to review this formula by 1997. Includes the Charter of Rights and Freedoms (sections 1 to 34). Includes the "Notwithstanding clause" allowing governments to suspend the certain parts of the Charter of Rights and Freedoms for renewable 5-year periods (section 33) [Which Quebec has invoked for its language law, Bill 178, from Dec. 88 - 1993]. Includes a comprehensive schedule (a table) affecting many constitutional documents, including repeals and re-enactments. Never signed by the separatist Quebec government of the day, or even since then, but nevertheless is legally binding throughout Canada. This is the first time the Constitution of Canada formally mentions the existance of the Prime Minister. No other Act explicitly creates that office, demonstrating that parts of Canada's Constitution is unwritten. The Document that the Queen signed at Parliament Hill making the Constitution Act, 1982, law. Entrenched the recognition of rights obtained under aboriginal land claims agreements. Committed all governments to invite aboriginal and territorial government representatives to conferences on issues related to them. Replaced section 51 of the Constitution Act, 1867. It did away with the old, complex formula that the Mulroney government claimed would have created too many House of Commons seats, therefore costing more money. Amended Term 17 of the Newfoundand Act (formerly the Terms of Union of Newfoundland with Canada) to include rights and privileges of more denominational schools. Amends the Charter of Rights and Freedoms to include the equality of the French and English linguistic communities in New Brunswick. Includes a provision for the New Brunswick legislature and government to "preserve and promote the status, rights and privileges," of those communities. Repeals and replaces Term 17 of the Newfoundland Act. Allows the government of Newfoundland to take control of establishing and continuing denominational and nondenominational schools. Proposal of the amendment was approved by provincial referendum in the Fall of 1995. Added Section 93A to the Constitution Act 1867, which excludes Quebec from the section relating to the organization of schools in the province (section 93). This gives it the sole power to determine the system of education used there. Chief motive was to allow Quebec to reorganize the school boards along linguistic lines. Further refines the issue of denominational schools in Newfoundland. There is no mention of denominational schools, so a single school system can be established. Courses in religion are guaranteed, including religious observances at the request of parents. Amends the Constitution Act, 1867, to raise the number of senators to 105 from 104, to allow Nunavut to be represented by one Senator. Also raises the maximum number of Senators to 113 from 112. Amends section 51(2) so that Nunavut is represented by one member of Parliament. Will come into force on the same day as the Nunavut Act, on April 1, 1999. Officially changes the name of the Province of Newfoundland to the "Province of Newfoundland and Labrador". Amends The Terms of Union of Newfoundland with Canada to reflect the changes. Amends section 51 of the Constitution Act, 1867, to change the rules for calculating the number of seats in the House of Commons. Last updated: 12 September, 2018.